Tipe: Body Scan / Check Detector, Handheld. Aplikasi: Mall, Acara, Mass Control, Pengadilan, Bandara, dll. NO.1 HANDHELD METAL DETECTOR WORDWIDE! 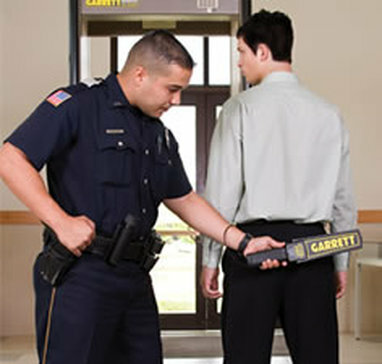 The Superscanner V is the most used handheld metal detector for security purposes worldwide. This is simply due to its outstanding quality. The Superscanner V is lightweight, very easy to operate (failsafe) and even easier to maintain. It provides optimal sensitivity and reliably detects all potentially dangerous metal objects. The Superscanner V is manufactured in the USA and comes with a 1 year warranty for parts and services. Please beware of cheap fake products from China or Taiwan and make no compromises when it comes to your safety. The Original Garrett Superscanner V will ensure you have top quality and safe operations. Ultimate Sensitivity Extremely sensitive towards dangerous metal objects. Sangat sensitif terhadap benda logam. Rugged / Desin Robus ABS case with reinforced coil compartment. Exceeds Mil-Std-810F (drop test) Method 516.5, procedures II and IV. Quick Scan Speed Large 8" scan surface for quick, thorough scanning. Alarm Sharp audible alarm and bright red LED indicates the detection of metal. Power Battery. Single 9 volt battery provides up to 100 hours of normal operation. Warranty 1 Year. Service and Parts.